Securing and sealing joints with precoated threads. 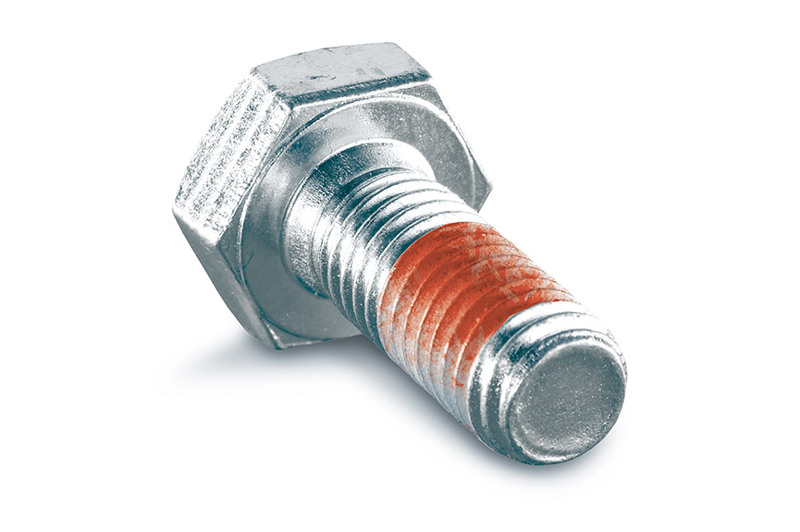 Unsecured threaded connections can lose their preload force if subjected to vibrations or dynamic loads. This means that components are no longer held together securely. 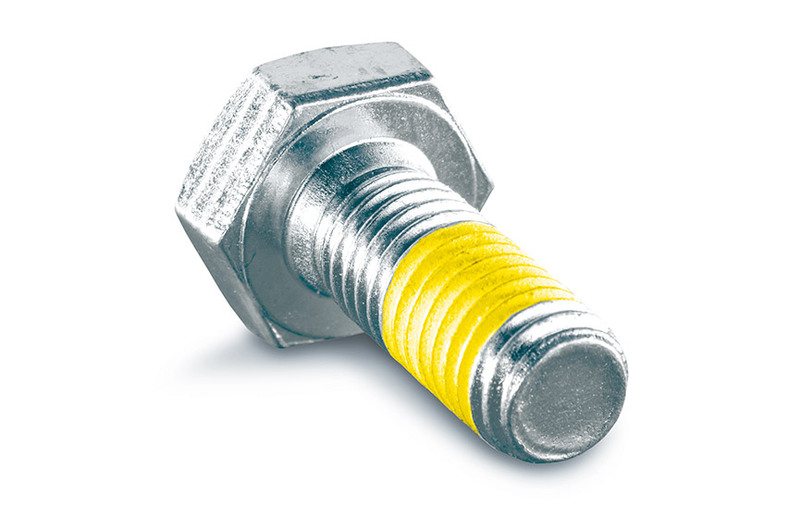 In the worst-case scenario, the threaded connection may fail completely. To avoid such failure Böllhoff offers a wide range of chemical thread retention solutions, which are designed to cover different requirements and applications. The threads are precoated with an appropriate chemical thread retention product, depending on the required function. 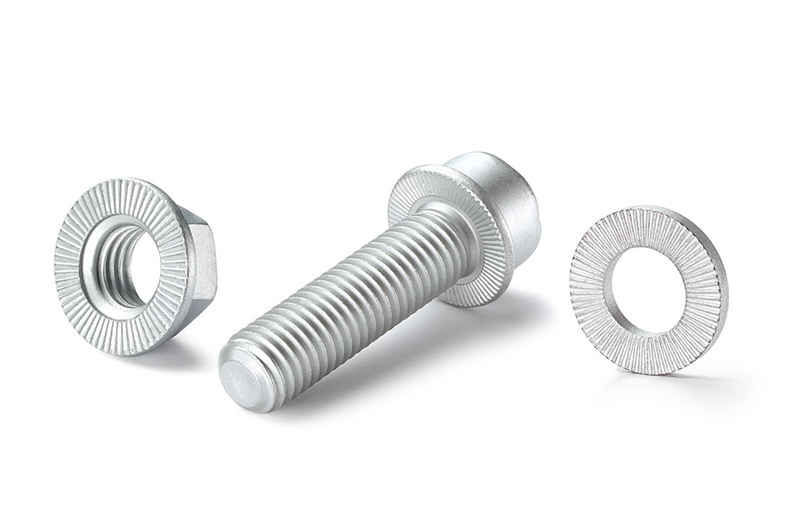 There are two main product types: micro-encapsulated precoatings, which cure when the screw is fastened, and polyamide spot precoatings, which bring about a locking retention effect in the thread. Any thread can be precoated with a chemical thread retention product, regardless of shape and size and of whether it is a standard or a custom-made part. These products are suitable for a wide variety of applications, thanks to a broad temperature range and their resistance to most oils and greases. Very safe, no risk of forgetting the lock washer or the anaerobic adhesive. No additional fitting of a sealing and retention element required. Reproducible, defined assembly values and easy, problem-free storage. No geometric changes necessary; can be integrated into existing applications. Individual coatings possible, depending on requirements and customer specification. Böllhoff provides an alternative to anaerobic adhesives in the form of precoated chemical thread retention solutions, which may be adhesive, locking or sealing. Precoating has the advantage that the coating no longer has to be applied manually during assembly. 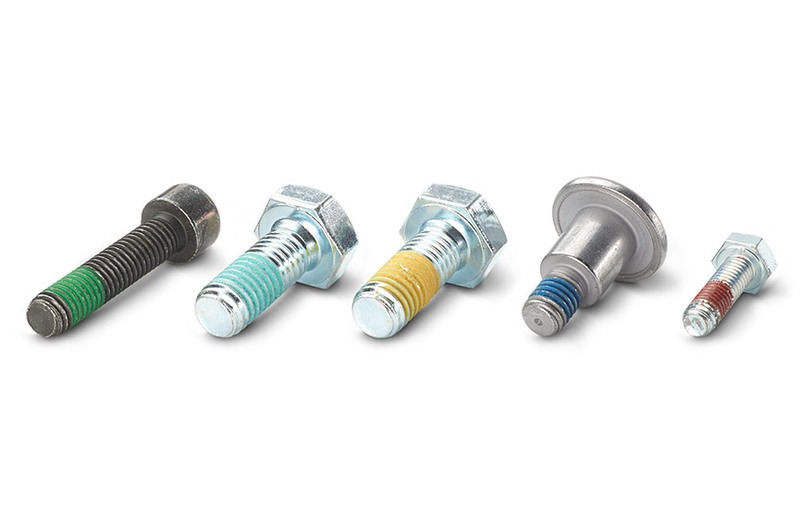 Instead, the process takes place before the fastener is supplied. 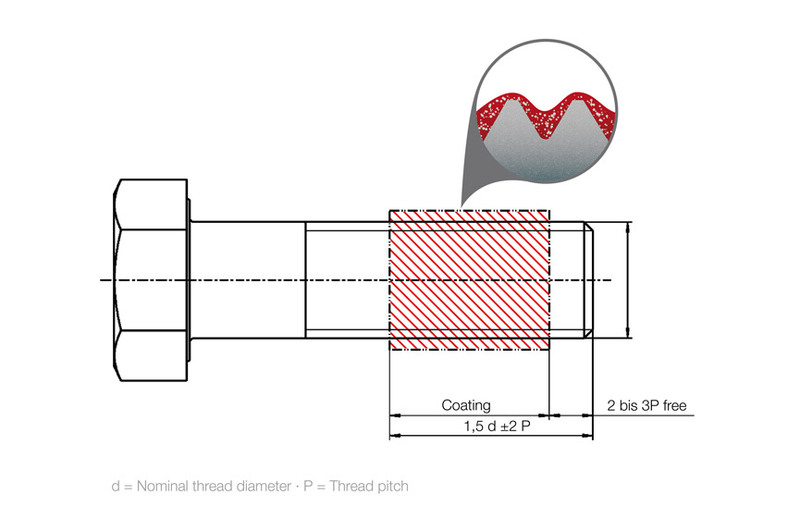 There are two types of chemical thread retention methods: adhesive micro-encapsulated and locking polyamide coatings. The pressure and/or shear forces produced as the fastener is tightened cause the micro-capsules to rupture. The adhesive contained in the capsules then combines with a hardener. This results in a chemical reaction (polymerisation) and hardening of the adhesive (adhesive bonding), thereby producing the desired locking effect. Bonding the internally and externally threaded components in this manner is a reliable way of preventing loosening of the threaded connection. The locking precoating method involves applying a polyamide spot to a section of the thread. The axial clearance between the external and internal threads is filled by the coating, which results in high surface pressure between the coated thread and the flanks of the uncoated mating thread. The screw is securely locked in position to prevent loss. The pressure and/or shear forces produced as the fastener is tightened cause the pre-applied micro-capsules to rupture. Bonding the internally and externally threaded components in this manner is a reliable way of preventing loosening of the threaded connection. The adhesive contained in the capsules then combines with a hardener. This results in a chemical reaction (polymerisation) and hardening of the adhesive (adhesive bonding), thereby producing the desired locking effect. Bonding the internally and externally threaded components in this manner is a reliable way of preventing loosening of the threaded connection. The preload force applied here is largely preserved (anti-rotation lock). Assembly should then be completed promptly after tightening. When the adhesive attains its full effect and when loading of the joint is possible depends on the type of precoating. Technical details of the individual types can be found in our product catalogue. The locking precoating method involves applying a polyamide spot to a section of the thread. The axial clearance between the external and internal threads is filled by the coating, which results in high surface pressure between the coated thread and the flanks of the uncoated mating thread. This creates the desired locking effect. Polyamide precoating is an anti-loss mechanism and is not aimed at preserving the preload force to its full extent, but rather at preventing the threaded connection from falling apart completely. Multiple use is possible, bearing in mind that the clamping forces are reduced each time. It is also possible to apply the polyamide spot all the way around the screw shank (360°). 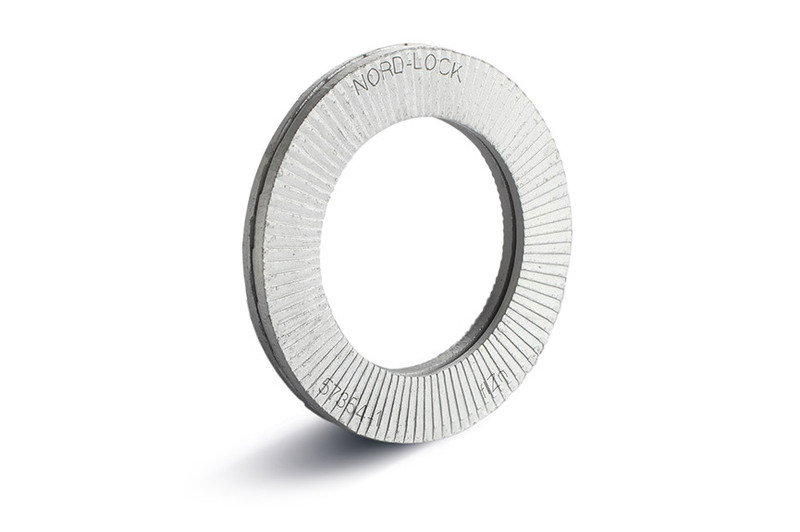 Although this slightly reduces the locking effect, it produces an additional sealing effect.